This day followed the same format as the 4 previous ones I’ve been to (2012, 2011 etc). That means an early start to meet up for the 100 mile convoy down from Manchester via Lymm Services and Stafford Services picking up cars on the way before the main rally point at Telford Services. After meeting up with 30 or so other Scirocco enthusiasts it was time to make the last 5 mile run to RAF Cosford the location of the meet. It was a great day meeting up with new faces and catching up with old friends as well as seeing what everyone’s been up to with their Sirocco’s. The variety of styles was as always perfect from perfectly maintained stock cars to full modified monsters. 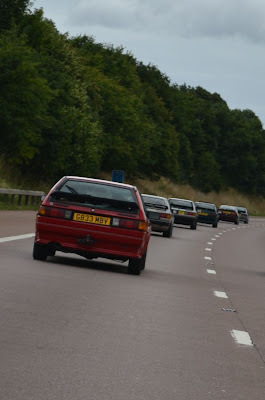 The biggest surprise though, unlike last year when only a single Mk1 turned up and only for a few hours, was the attendance of 13 Mk1’s which was just awesome to see so many in the same place. It was jokingly mentioned that they seemed a little too common!!!! Another great at fantastic venue, already looking forward to driving my Rocco to the one next year.